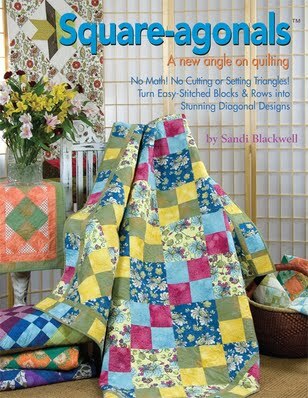 Inventory Reduction Sale - We need to make room for all of the fun stuff we have coming in 2012 from Fall Quilt Market. We thought about adding on, but there's no room to grow. :) The sale will be January 12th - 14th with discounts on select merchandise. Thursday will be 40% off, Friday 50% off, and Saturday 75% OFF!!! Super Sew for Super Bowl - The first Sunday of February every year is reserved for beer, food, and football.....but not this year!!! 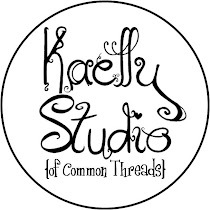 We invite you to join us sewing AND watching the Super Bowl. There will be games and giveaways including a $50 gift certificate. Leap Year Sales Event - It only comes once every 4 years, so we're gonna make the best of it. Join us for open sewing and Leap Year discounts including 29% off or double punches on your card. Play Leap Frog and get even more of a discount. Relay for Life Auction - We have officially started our own Relay for Life team. Our team name is "The Polka Dots" in honor of our father/grandpa who passed away from pancreatic cancer....he LOVED Polka music! To help raise money we are having an auction in March. 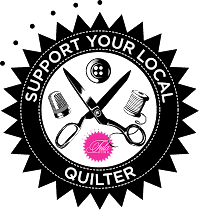 The reason we are telling you about it so soon is because for every dollar you spend at the quilt shop between January 18 and March 23 you get 2 Quilt Bucks you can use during the auction. You can also use real money, but your Quilt Bucks are just a valuable. PLEASE invite everyone you know because we're not just going to be auctioning quilt stuff but gift certificates to area businesses and other fun things. More details to come! We know we're getting quite close to Christmas, but we couldn't help but show at least one Christmas project. Using the Square-agonals technique (featured in last month's Teaching Thursday) we created kits for a table runner out of the Countdown to Christmas line. 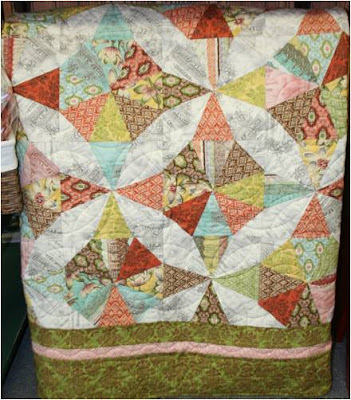 We used the Accu Quilt to cut each piece so there's not much cutting needed, just sit down and start sewing! The kit is only $14.99 (you will need to purchase the book as well - $24.95). Using the same technique we created one with Hometown by Sweetwater so you can make one to display all year round! Curio uses the Kaleido-Ruler (our only new notion this month - $17.00) to create the illusion of circles in this pretty quilt that reminds us of Paris, France. 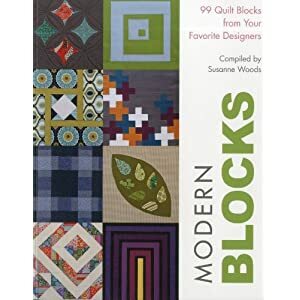 Holly used the Statler to create individual patterns for each block and the borders, it was her first time trying this intense technique and it turned out beautifully, she can do it for you too! We added some more pieces to our color wall...it was looking kinda sad. 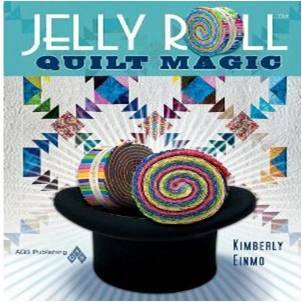 We filled it with "Tic Tac" and "Dimple" by Andover Fabrics. Hoffman has some new, rich Batiks so we had to show some of them as well. Holly Taylor is back to designing with "Birch Bark Lodge". The line has patterned pieces and Batiks. Mix and match for a modern rustic look. Shenandoah is a pattern designed by Deanne Quill of Creative Solutions. It is a great pattern for fabrics in which you want to showcase the design of the fabric and don't want to cut up too much. 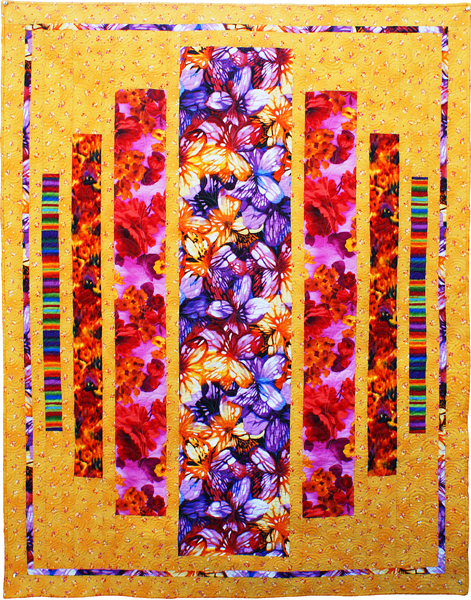 The finished quilt measures 54" x 70". 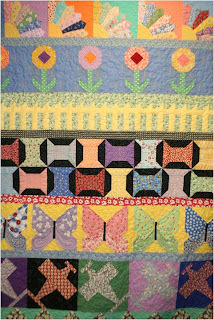 Big, beautiful flying geese weave a whimsical trail through this simple striated quilt top in Come Fly With Me. The great contemporary look is equally effective with and without borders. Size options: 55" a 75" without outer borders (large throw) and 69" x 89" with outer borders (twin). Short Circuit certainly isn't short on style or pizzazz that's for sure. 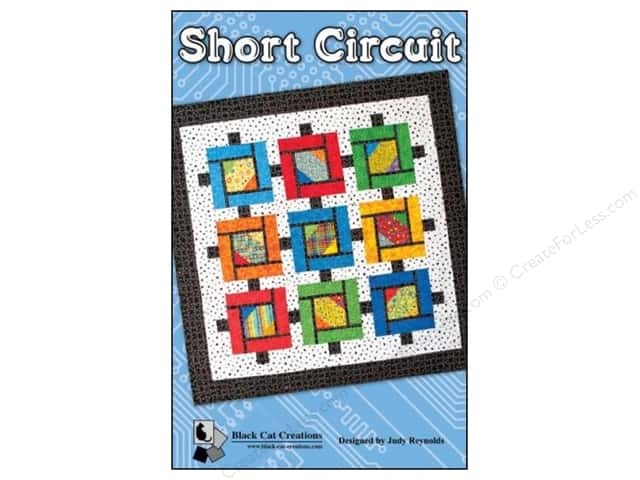 The only "short" in sight is the short amount of time it'll take to make the blocks. 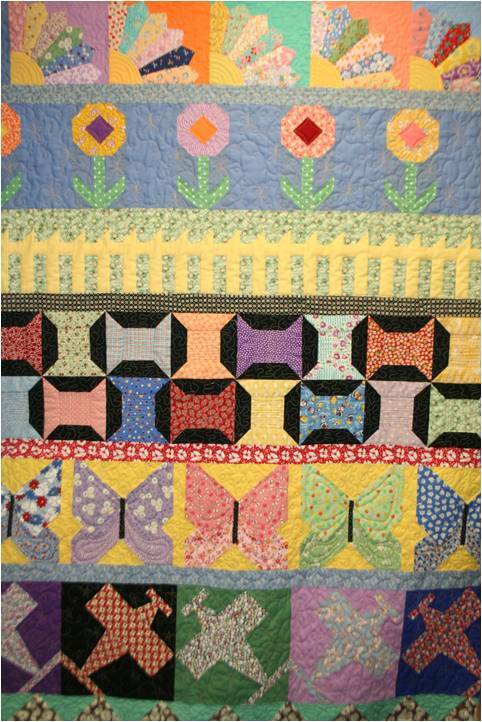 Use craps, charm packs, jelly rolls, anything goes in this fun bright quilt. Finished siza 49" x 49". 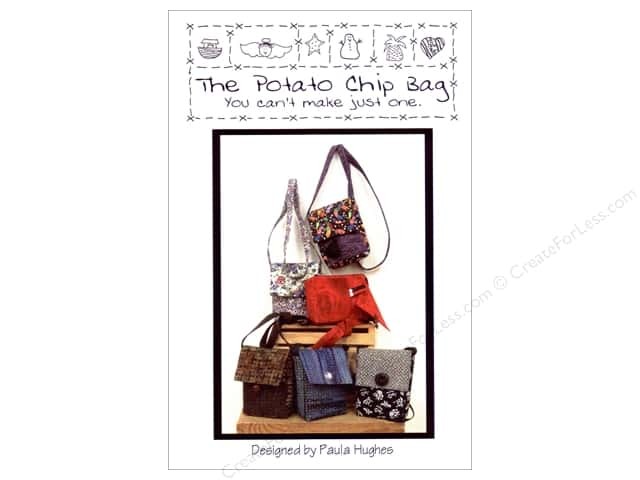 Just throw the Potato Chip Bag over your shoulder and you're out the door. With pockets on the outside and lined with pockets on the inside too. Named because they're small and addictive, bet you can't make just one. Finished size 6" x 7" x 2". The Little Twister Tool is a lot of fun and when your projects are complete it looks as though you've spent hours working on these small projects. "Patriotic Twist" and "Twisted Christmas". Merry Christmas to you all! Enjoy the season! Merry Christmas to you too and Happy New Year!